In this post we are going to solve Arduino software and driver related issues which are driving some beginners crazy, we will also address some of the issues related to Arduino hardware. Why your Arduino is not detected by your computer? You landed on this page because you could not upload your sketch to Arduino or it is not even detected by your trusty computer. Here we will discuss the possible problems why your Arduino board is not detected or why you couldn’t upload the sketch/code and we will see the recommended solutions. Let’s starts with a common issue. This is a very common issue faced by most Arduino beginners and sometimes even who has intermediate experience with Arduino. 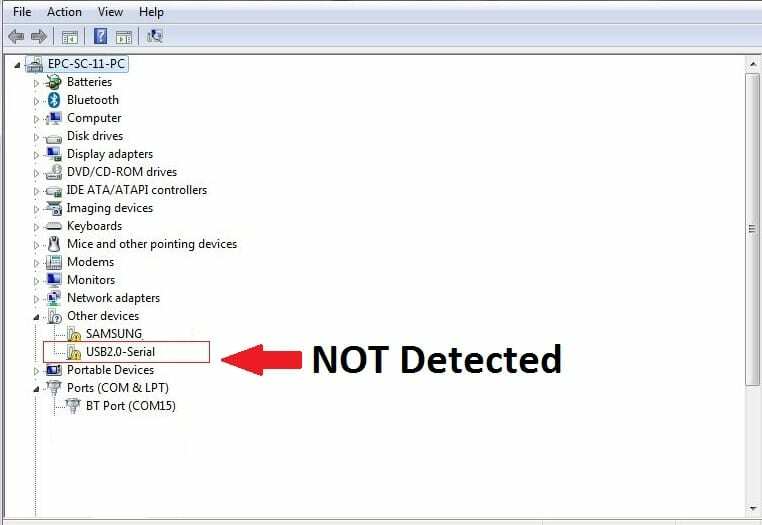 Your IDE will not show the connected Arduino board and you device manager will say “unknown USB device”, when you try to fix with windows tools you will still end up not fixing the issue. 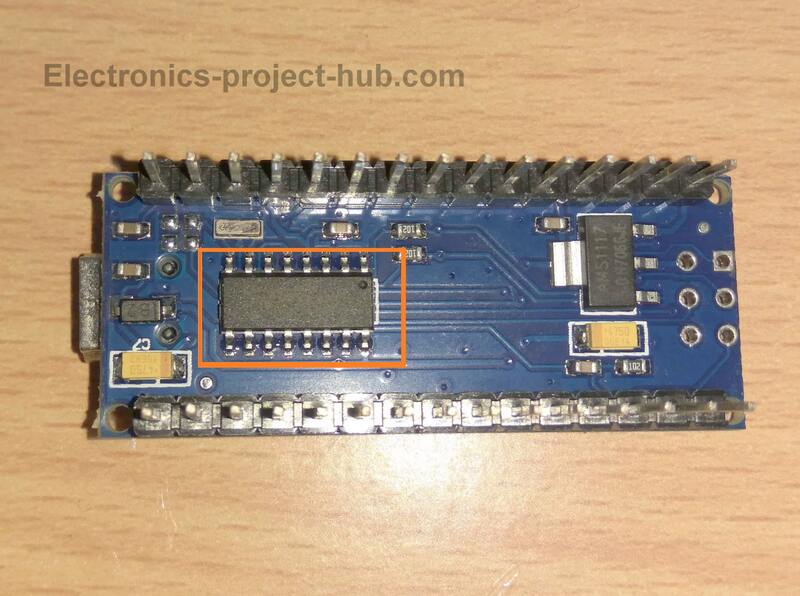 To find out why the Arduino boards are not detected, let’s inspect the Arduino board’s USB to serial converter chip. The USB to serial converter is utilized on Arduino boards for uploading sketches to main microcontroller and also for serial communication between the computer and the main microcontroller. 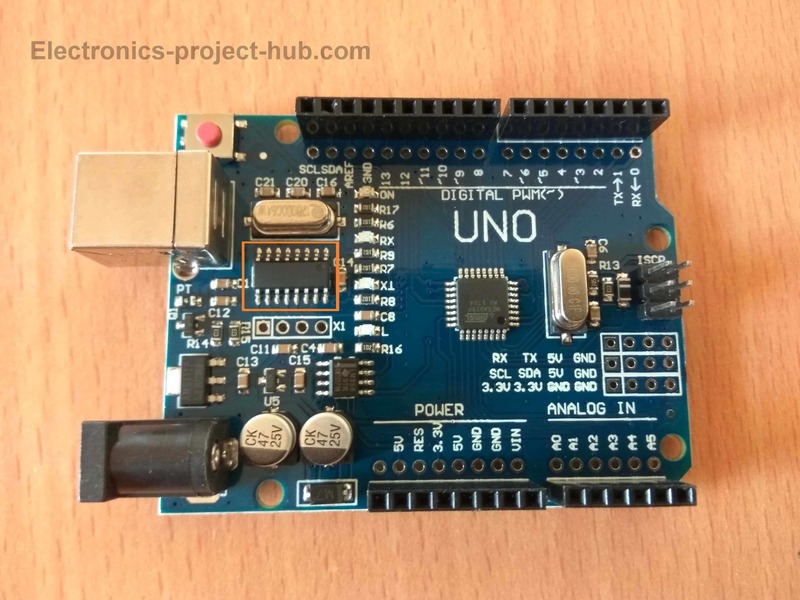 Here is an Arduino UNO clone with ATmega16U2 controller which is used as USB to serial converter, the ATmega16U2 is actually a microcontroller. The ATmega16U2 is also utilized on a genuine Arduino boards. The clones which utilize ATmega16U2 as USB to serial converter for the main microcontroller won’t have any issues with detection. Now let’s inspect another Arduino board clone which doesn’t utilize ATmega16U2 for its main microcontroller. The above Arduino board is SMD type; this board has exactly same specification as genuine Arduino UNO. As you can see there is a difference in the USB to serial converter chip. This is called CH340G USB to serial converter chip. You can see this on cheap Chinese Arduino clones; this chip will not be detected neither by your computer nor the IDE. 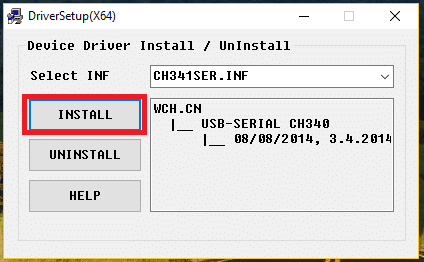 You have to install CH340G driver to your computer only then your computer will recognize the device and able to upload sketches. Download the CH340G drive from the given link. It will ask for administrator permissions, click YES. Now it will prompt you with 3 options: Install, uninstall and help. 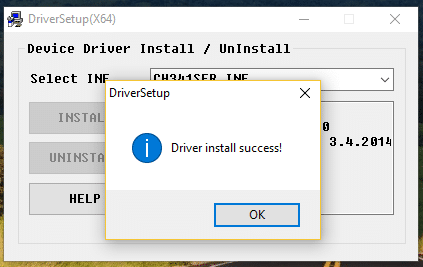 Click Install, once the driver installed it says “Driver Install Success”. Restart your computer after installation (Important). NOTE: Some users notified that Arduino clones which use CH340G chip are not working properly on USB 3.0. Please comment if you face similar issue. By now majority of the problems would have been solved with Arduino boards. Now let’s discuss some other issues faced by arduino enthusiasts. These are the possible explanations for not able to upload the sketch to Arduino and their solutions. Most beginners make this mistake, they select wrong COM port. Each computer has different COM port numbers and you have to select the right one for your PC. 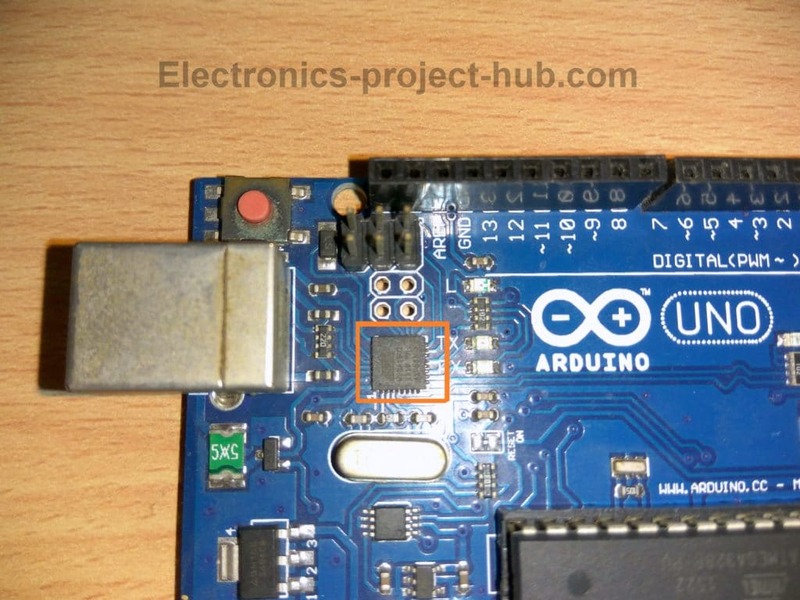 If your Arduino board sport ATmega16U2 chip it will show you to which COM port number your board is connected to and select that one. If your Arduino board sport CH340G chip, it won’t show you the connect COM port number and you have try each of them that is displayed. You have to select the correct board option. If you choose Arduino Nano for Arduino Uno, you code will not get uploaded. You should select the right micro-controller IC number at tools menu otherwise the code will not get uploaded. Connect your Arduino board to a good USB port of your computer and make sure that USB port on the Arduino board has no physical defects. Try connecting to another USB port of your computer; if problems arise from a particular USB port don’t use that again. Inspect for physical damages on Arduino board. Grab a magnifying glass and take a closer look at the traces and solder joints of USB to serial converter chip and main microcontroller IC, if any defect found try to solder them. If you find any physical damage on the ICs such as cracks or burn marks, you may replace the component or replace the whole board. There could be defects with microcontrollers or any passive or active components which are not visually inspect-able neither replaceable, in such case replace the whole board. Download a fresh copy of IDE from the official website of Arduino and install to your computer. There could be situations where the newer IDE didn’t work well with your Arduino board, if so please try roll backing to the previous version which you have been using before. This is the final troubleshooting step if can’t get your Arduino board to work. Connect your board to another computer which is known to upload Arduino sketches without any issues currently. If still issue persist with your board, just replace it. By now you should be able to find issues with your Arduino and able to fix it. If you have any further questions, please comment below, you will get a guaranteed reply from us. do you know how to fix with atmega16u2 chip?